ITHACA – Robert L. Miller, age 73, of Ithaca, a retired carpenter died Friday November 25, 2005 at Cayuga Medical Center in Ithaca. Mr. Miller was born June 28, 1932, a son of the late Edward and Agnes Harris Miller. He was an avid outdoorsman who enjoyed camping and hunting. LANSING: Anna L. Hancharik, 74 of 1892 East Shore Drive, Lansing, New York died at 11:50am, Thursday, November 10, 2005 at her residence. Born May 27, 1931 in Barnesboro, Pennsylvania, she was a daughter of the late Frank and Anna (nee Presloid) Weakland. Mrs. Hancharik was a parishioner of Immaculate Conception Church, Ithaca, a member of the Knights of Columbus Ladies Auxilliary and retired from Ithaco, Inc., where she had been employed as an assembler. Rodney R. Linderberry, Sr., "Butch"
GROTON: Rodney R. Linderberry, Sr., "Butch", 54 of 55 Bacon Road, Groton, New York died at 11:20pm, Sunday, October 23, 2005 at University Hospital, Syracuse, New York. Mr. Linderberry was born April 9, 1951 in Ithaca, New York, a son of the late Oscar and Alberta (nee Squires) Linderberry. He was employed as a Custodian at Cornell University, Ithaca, New York. ITHACA - Linda Ford-Onan, age 61, a former housekeeper at Cornell University, went to be with Our Lord Saturday afternoon, October 8, 2005, at Hospicare in Ithaca. Mrs. Ford-Onan was born November 29, 1943 in Syracuse, a daughter of Margaret L. Rochen Keyser of Liverpool and the late Frank Ford. Mrs. Ford-Onan will always be remembered for her kind and caring spirit that she shared with everyone. This generous spirit sponsored numerous less fortunate children around the world in various charitable missionaries. She was also a published poet. Before her employment with Cornell, she was a nurse's aid at Lakeside Nursing Home in Ithaca. ITHACA – Eugene T. “Mickey” Nesbitt Sr., age 83, a retired machinist with Morse Chain and a former resident of Binghamton and Danby, died Sunday evening at Lakeside Nursing Home in Ithaca. Mr. Nesbitt was born October 25, 1921, the son of the late Willis and Grace VanHusen Nesbitt. He enjoyed collecting teddy bears and cups. He was an avid camper and enjoyed watching old movies, Westerns, traveling and vacationing with the family. He was a member of the Danby Federated Church and a cook in the US Army during World War II. Prior to his employment with Morse Chain, he was employed with Endicott Johnson Shoe Company as a laborer. OXFORD – Mr. Jacob G. Johnson, age 86 of Oxford and formerly of Ithaca, went home to be with Our Lord and Savior on Tuesday afternoon (September 20, 2005) at the New York State Veteran’s Home in Oxford. He was born in Ithaca on March 14, 1919, a son of the late Charles Phillip and Bertha Mae Moss Johnson. Prior to his retirement, he was an auto mechanic. LANSING: Donald V. De Chellis, 56 of 11 Salmon Creek Road, Lansing, New York died at 6:15pm on Monday, September 19, 2005 at Cayuga Medical Center at Ithaca. Born April 6, 1949 in Ithaca, New York he was a son of the late Leo and Alberta (nee Nash) De Chellis. Donald was a self employed contractor who will be dearly missed his family and friends. He was an avid NY Yankees fan. BROOKTONDALE – Mrs. Ellen F. Robbins, age 93 of Brooktondale, went home to be with Our Lord and Savior on Saturday (September 17, 2005) evening at Cayuga Medical Center. She was born in Sullivan on September 26, 1911, a daughter of the late Charles Phillip and Bertha Mae Moss Johnson. Ellen spent most of her life being a loving wife, mother and grandmother. In her earlier life, she worked at the Ithaca Pocket Factory. She was a devote member of St. James AME Zion Church where she was a deaconess. New York City – Ricky Charles Johnson, age 56 of New York City, died August 18, 2005 at his residence. Mr. Johnson, also known as “Big Rick,” was born April 25, 1949 in Ithaca, a son of the late Lois Johnson. 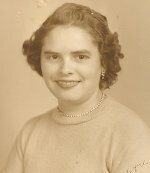 ITHACA – Laila L. Steele, age 88 of Ithaca, a retired assembler with National Cash Register, died Thursday (September 15, 2005) at the Reconstruction Home in Ithaca. Mrs. Steele was born March 7, 1917 in Calumet Township in Michigan, a daughter of the late Hannes & Emma Runttila Keturi. Mrs. Steele was an avid reader and she enjoyed gardening, bird watching, cooking and canning. She will always be remembered for her appreciation for nature and taking long walks on her property. GROTON: Laura R. Geiger, 66 of 9 Searles Road, Groton, New York died at 3:34pm, Saturday, September 10, 2005 at her residence. Born November 18, 1938 in Ithaca, New York, she was a daughter of the late George and Alice Moffett Rankin. Mrs. Geiger was a graduate of Genoa Central Schools, Class of 1957 and was Salutorian of her class. She was a day care provider, operating her own business known as Laura's Day Care. ITHACA – Harold “Cookie” Douglas Cook, age 90 of Ithaca, a retired lighting technician with New York State Gas and Electric, was reunited with his beloved “Paulie” on Thursday morning (September 8, 2005) at the Hospicare residence. Mr. Cook was born January 20, 1915 in Ithaca, the son of the late Howard and Marguerite Johnson Cook. ITHACA – Eugene “Gene” Winston, age 78, of Ithaca, died Friday afternoon (September 9, 2005) at Cayuga Medical Center after a lengthy illness. Mr. Winston was born January 7, 1927 in Arkansas, a son of the late John Winston and Daisy O’Daniel Winston Jackson. His wife of 57 years, Patricia Hoover Winston, died the previous day. ITHACA- Patricia “Patsy” M. Winston, age 76, of Ithaca, died Thursday afternoon (September 8, 2005) at Cayuga Medical Center after a short illness. Mrs. Winston was born June 16, 1929 in Allendale, SC. She recently celebrated 57 years of marriage with her husband, Eugene Winston who died on Friday (September 9, 2005). ITHACA - Patricia Ann Holloway Sherman, 58, passed away on Tuesday, July 26, 2005, at her home after a long and courageous battle with cancer. She was born on May 6, 1947, in Scipio, NY, daughter of the late Frank and Issabelle Brown Holloway. Patricia was married to the late Ronald Comstock, Sr., in 1965. In 1979, she married the late Richard Sherman. She was also predeceased by her two brothers, William and Frank Holloway. LANSING - Stephen A. Fedorka Sr., 85, of Lansing, passed away on Wednesday, July 27, 2005 at his home. He is survived by his wife, Betty June; his three sons, Stephen Jr. (Barbara), James Byron (Holly), Edward Lee; his daughter, Mary; his sister, Helen Berger (Robert); his stepsister, Anna Lucas; and his numerous grandchildren, nieces and nephews. He was predeceased by his father and mother, Charles and Julia Ann; his brother, Charles; his son, John Charles; and his sister, Elizabeth. Mr. Fedorka was born in Czechoslovakia on April 4, 1920 and came with his mother to join his father in Pennsylvania when he was two years old. LANSING - Myrtle Smith, 81, of 1972 East Shore Drive, Lansing, New York died at 5:45 p.m., Tuesday, June 14, 2005, at Cayuga Medical Center at Ithaca. Born April 11, 1924 in Moravia, New York, she was the daughter of the late William and Ethel (nee Leonard) Bross and the widow of David R. "Bob" Smith, who died June 15, 1998. Mrs. Smith was a member of Grace Baptist Church, Lansing, NY. Barbara Ellen Schrier, age 78 of Ithaca, died Saturday at Cayuga Medical Center. Mrs. Schrier was born in Myra, West Virginia, the daughter of the late Joe Hedrick and C. Alberta Porter. She was an avid letter writer who enjoyed keeping in touch with her family. She spent a significant amount of time supporting Muscular Dystrophy organization. Her husband, Charles C. Schrier died on March 9, 1975. Survivors include her four sons, Larry Schrier, Walter Schrier, Edwin Schrier, and Stanley Schrier; one daughter, Nancy Schrier; a granddaughter, Jessica Schrier and a grandson, David Tulley; two sisters, Devanis (Don) Milburn and Doris Thompson; two brothers, Shirley (Frances) Gallimore and Garry (Nancy) Gallimore; several nieces and nephews. She was the sister of the late Charles, James, and Melvin Gallimore.